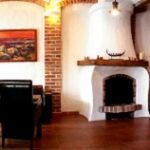 An amazing fireplace room perfectly combines wood and white of walls, which is a supplement of the fireplace’s simplicity. It is a favourite place for spending free time, where our guests play billiard or bridge and can be delighted with a glass of wine. Our romantic fireplace room often becomes a silent witness of important moments like engagements, intimate wedding ceremony or christening. From our terrace, which is also a very magical place, you can see another part of the garden – the grove. The size of the room is 63 m2 and is designed for about 30 people.